Continuing along with the parade of delicate, flowery and earthy reds, today I'm all geeked up for the Trousseau (and Jaune) or Michel Gahier. The reds of Gahier always occupy a special place for me, because they're some of the first wines of the Jura that I really fell in love with and, to this day, they're still among my favorite. Clear back to when I first started out selling wines, I've always had an affinity for light reds, and now thinking back, it's funny how far we've come since those days. In, say, 2003, trying to sell something like a Beaujolais, Spatburgunder, Torrette, etc., was, to put it mildly, a lot more difficult, especially if you were the young guy on the floor. Such recos were usually met with a 'where is your Chilean section? ', if you got any response at all, that is. Now, things are a lot different. 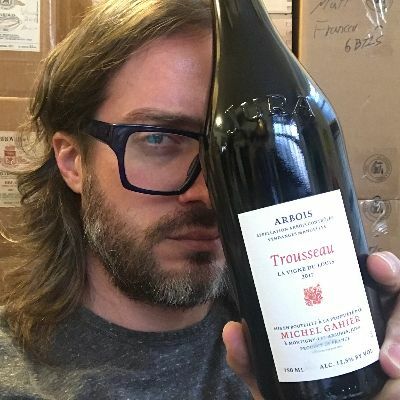 Sure, I'm in the Manhattan bubble here, and I'm sure it's not this easy everywhere, but we should be proud how far we've come that a set of wines like these Trousseau of Gahier, so light there are rosés with a deeper hue, are now tightly allocated. That's all to say nothing about oxidative masterpieces like the Vin Jaune. Yet here we are...and here I am offering out my meager, once-a-year shipment of two of my favorite Trousseau bottlings on the market, the ultra-friendly Le Clousot and the infinitely supple Vigne du Louis (always my real favorite in every vintage), both from 2017, and of course, the Vin Jaune 2010. The Clousot comes from the youngest vines and is the lightest, friendliest, most delightful little red wine you'll encounter. So transparent, so bright, so lively, so flowery. It's so pristine-ly red, so pure, so compact in nature, it's hard to verbalize...but it's really easy to enjoy...especially if you give it a few years in the cellar. Of course, though, one can't talk about the Jura and not talk about Vin Jaune, the peak expression of the Sous Voile style. There's really nothing quite like the excitement of seeing the cheese cart roll up while that pungent, nutty, salty character wafts up from your glass. While that may have been the nerdiest wine statement I've made in a long time, I stand by it - sticky, gooey, funky cheese and a glass of the 'yellow' is one of the truly singular experiences in food/wine. The daintiest reds and the strongest white...the perfect things to celebrate how sophisticated we've become! Oh, and I almost forgot the wildly drinkable Cremant de Jura...which is maybe Gahier's most popular wine!